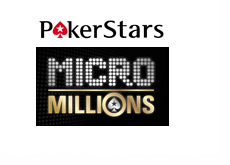 Pokerstars revealed the schedule for MicroMillions 7 earlier today. MicroMillions 7 is going to feature a total guaranteed prize pool of $5 million spread over a total of 100 events. The tournament series will begin on March 13th and run until March 23rd. The MicroMillions 7 main event, which will get underway at 15:30 ET on March 23rd, will have a total guaranteed prize pool of $1 million, with the eventual winner receiving a minimum of $75,000. The buy-in for the main event will be just $22. The MicroMillions 7 will kick off with a $0.11+R NL Hold'em [Hyper-Active] event at 13:00 ET on March 13th and conclude with a $1+R NL Hold'em [Hyper-Turbo] event on March 23rd.